The increasing number of methods available for schema matching/ontology integration suggests the need to establish a consensus for evaluation of these methods. 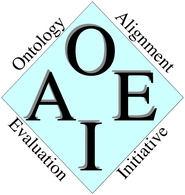 Since 2004, OAEI organizes evaluation campaigns aiming at evaluating ontology matching technologies (see http://oaei.ontologymatching.org/2004/Contest/, http://oaei.ontologymatching.org/2005, http://oaei.ontologymatching.org/2006, and http://oaei.ontologymatching.org/2007). The OAEI 2008 campaign is associated to the ISWC Ontology matching workshop to be held at Karlsruhe, Germany on Sunday October 26, 2008. This year's campaign consists of four tracks gathering eight data sets and different evaluation modalities. features networked ontologies from domains related to fisheries manipulated by the Food and Agricultural Organization of the United Nations (FAO). The mldirectory real world case consists of matching web sites directories (like Dmoz, Licos and Yahoo's) in different languages (English and Japanese). These are exerpts of the directories which contain around one thousand categories. Two SKOS thesauri about books have to be aligned using relations from the SKOS Mapping vocabulary. Samples of the results are evaluated by domain experts. This real world test case requires matching of very large resources (vlcr) available on the web, viz. DBPedia, WordNet and the Dutch audiovisual archive (GTAA), DBPedia is multilingual and GTAA is in Dutch. Participants will be asked to freely explore a collection of ontologies used for organising conferences (the domain being well understandable for every researcher) with regard to two possible tasks (generic correspondences or application-specific correspondences). Results will be evaluated a posteriori in part manually and in part by data-mining techniques and logical reasoning techniques. There will also be evaluation against reference mapping based on small subset of the whole collection. requires that participants send their results to organisers, the results are not pre-determined through reference alignments but computed and/or discussed as a consensus among given results. Participants will also provide, for September 26th, a paper to be published in the proceedings and a link to their program and parameter set. From the results of the experiments the participants are expected to provide the organisers with a paper to be published in the proceedings of the workshop. The paper must be no more than 8 pages long and formatted using the LNCS Style. To ensure easy comparability among the participants it has to follow the given outline. A package with LaTeX and Word templates is made available here. The above mentionned paper must be sent in PDF format by September 26th to Pavel Shvaiko (pavel (�) dit dot unitn dot it) with copy to Jerome . Euzenat (�) inrialpes . fr. The results from both selected participants and organizers will be presented at the Workshop on Ontology matching at ISWC 2008 taking place at Karlsruhe (Germany) on October, 26th, 2008. We hope to see you there.